"One of the most beautiful places I've visited in my 5 years stay in Hanoi, Vietnam. It is relatively easy to go to this place. I took a night bus from Hanoi to Cao Bang city ($9 ticket). Then from Cao Bang, I went to the Ban Gioc waterfall by motorbike, which I rented in the hotel I stayed in Cao Bang. I chose this option as there are beautiful country sides and highway pass to explore on the way. If you are not a fan of motorbike, there are buses from cao bang to the waterfall ($3). When I went there in the first week of July and it was beautiful as it was just before harvesting. ou won't regret if you visit this place." 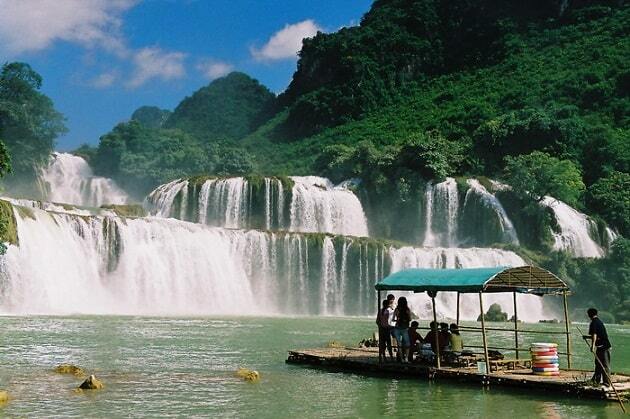 Cao Bang - is the name of the capital of the province in the far north of Vietnam, bordering China. It is "off the beaten track". Cao Bang is an "easy-going" gateway to the surrounding lakes, villages with minorities, karst peaks, caves and Ban Gioc Waterfall on the Chinese border. The capital is located 30 km from China and is a great stop for travelers coming or going to or from the Pingxiang border. For those who are tired of the tourist spots along the coast of Vietnam, Cao Bang gives a refreshing look at a city that is completely himself. Cao Bang is located on the route from Ha Giang to Lang Son and is only accessible by road. It has no train connection. A bus ride from Lang Son expensive soon about 4 hours. A trip to Hanoi takes about 5 hours and costs around $ 15. No wonder that this province is visited by few, although it's one of the most beautiful provinces of North Vietnam. The Capital Cao Bang is easy to explore on foot, but motorcycle taxis are convenient and cheap. The city has about 100,000 inhabitants. Bang Giang river divides the city in two. The bus station is on the eastern side of the river; over the bridge to the main street, Kim Dong (which runs parallel to the river). Here are also the markets and most hotels. 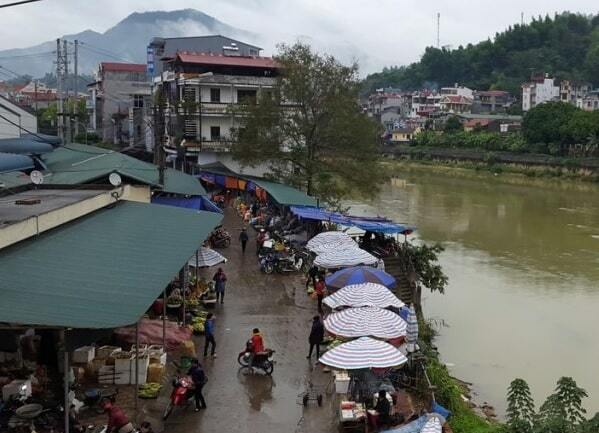 Markets in Cao Bang town is considered the largest in Vietnam. The town itself is small and dusty. The statue of Uncle Ho (Ho Chi Minh) is a reminder of the fact that he lived here. There are two markets near the river. The best organized market is in an indoor hall at the bridge and the main Kim Dong. It is also cooked food and sold household goods. The second market stretches along the river at the bridge and only in the morning. Rural women come with their smooth sailing boats along the river to town to display their fresh fruit and vegetables on blankets and to sell it. Because Cao Bang is so close to China, that means that the city has a somewhat turbulent history. One time is has belonged to China, at other time it belonged to Vietnam. The last time, in 1979, the city was severely damaged by the Chinese, but since then everything is rebuilt. The province of Cao Bang is home to many Vietnamese ethnic minorities. The most notable of these are the Tay, Nung, Dao and Hmong. They try to maintain their traditional way of life in the more remote areas. Thang Hen Meer - surrounded by mountains, this serene lake is at its best in the rainy season. During the dry season the lake shrinks and is not as impressive, but there are a few rafts that you can take. Walking in the nearby mountains brings you past local herders and farmers. There are no buses to Thang Hen, so the cheapest option is to hire a motorbike driver for the half-day trip. It's about 1 hour away. 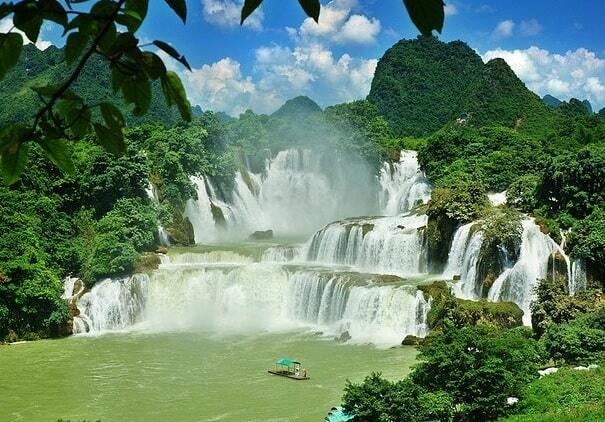 Ban Gioc Waterval - this breathtaking waterfall, the largest in Vietnam, straddles the China-Vietnam border. The water is particularly thunderous in the wet season but is still beautiful during the dry. You can take a raft out into the river to the base of the falls and greet Chinese tourists doing the same from the other side. You must buy a ticket from an office, and then you can walk to the waterfalls. Nguom Ngao Grot - ask your driver to take you to Nguom Ngao before or after Ban Gioc. This immense cave holds a series of majestic, jaw-dropping caverns, filled with delicate, intricate formations of stalactites and stalagmites. In the low season, you may even have the cave to yourself, an experience probably not to be had elsewhere. Optional guides will helpfully point out particularly interesting rocks and bat roosts. Pac Bo - is a small village in Cao Bang province, northern Vietnam, 3 km from the Chinese border. Near this village is a cave, Hang Coc Bo (today often called Hang Pac Bo) in which Ho Chi Minh lived for seven weeks, during February and March 1941, when he returned after 30 years of exile. Consequently, it is now a tourist site.